The 43rd Annual Mud Bowl kicks off this weekend and Gino was joined by two Mud Bowlers this morning to tell us all about it. Mount Washington Valley Hogs Quarterback Tommy Wagner and defending 2017 Champion North Country Mud Crocs Quarterback Jason Veno. Listen to the interview below and get all the details! “Mud Bowl Goes Under The Sea” is the theme for this year’s Championship of Mud Football sponsored by Miller Lite. The event will be held September 7th, 8th, & 9th at Hog Coliseum located at the North Conway Community Center. This is a twelve team touch football tournament played in deep mud. Money raised will be donated to the North Conway Community Center, Vaughan Learning Center, Carroll County Retired Senior Volunteer Program, as well as, other non-profits in the Mt Washington Valley. Each $15 ticket ensures entrance into the games Friday – Sunday and doubles as a raffle ticket for a $500 prize on Saturday & Sunday. Day tickets and a family package are also available! Team entertainment will surely have you laughing at the Annual Tournament of Mud Parade held Saturday on Main Street in North Conway at 10:00 AM. 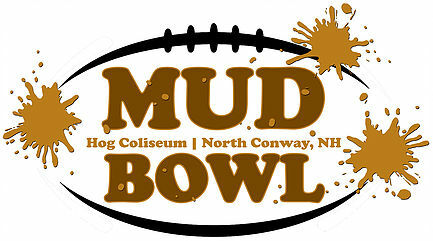 Teams include Mt Washington Valley Hogs, North Country Mud Crocs, Carrabassett Valley Rats, Mud Gumbys, North Shore Mud Sharks, New Hampshire Mudcats, Jack’s Predators, Cumberland Muckaneers, Rowley Mud Ducks, The Muddas, Massachusetts Mud Dogs, and Mud Things. Special Thanks to Local Sponsors Amoskeag Beverages and Miller Lite!